Ready to upgrade your TV? Let’s review some of the best 65 inch TVs currently available in Australia and how they can take your home entertainment system to the next level. TVs are bigger and better than ever before, and there’s a lot to choose from. 65 inch TVs are big but not enormous – in fact they fall within the preferred size range of the average home TV shopper. It’s a great compromise size between a nice big screen and being able to fit it in your home without taking up all of your free space. As TVs get bigger, they also get more expensive, so it’s important to make your choice wisely to get your money’s worth. For those of us who aren’t tech-heads, TVs all can look pretty similar, just coming in different shapes and sizes and occasionally some different plugs. However, there’s a staggering difference between TVs of the same size, so we’ve picked and reviewed five TVs to give you an idea of what sets them apart and hopefully help you pick the best one for you. They’re all top end TVs, so the difference is in the finer detail here – and, of course, the price tags. Using a compatible Samsung smartphone, Samsung’s new Smart Things app offers a simple way to setup up your TV. With a few taps on your phone screen, you can connect the TV to your wireless network and automatically sign in to Netflix, Spotify and other apps. Even when the TV is off, it features Samsung’s low-power Ambient Mode, which can replicate the wall behind your TV and blend into its surroundings or display a slideshow of your favourite family photos. The overall design is focussed towards looking clean and modern, notably achieved through the hidden wiring. The power and optical cables are neatly hidden in the stand. It’s also easier to plug things in – the one optical cable connects to an external box (called the One Connect) which houses all of your ports, so you can slip it inside a cupboard or on a shelf to make your entertainment system more streamlined and visually pleasing. The One Connect has four HDMI ports and three USB ports, in addition to the expected Ethernet, audio and video connections. It also includes a remote control, which not only works with your TV and One Connect, but with other compatible devices as well. 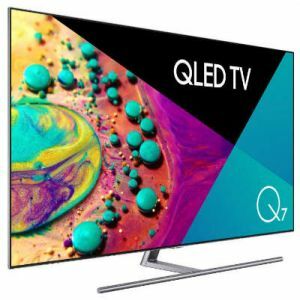 Looking into more technical specifications, Quantum Dot technology takes the light produced by the TV and boosts brightness and light purity for a more accurate colour reproduction, according to Samsung. It also features HDR10+ and Wide Colour Gamut, with a 200 Hz motion refresh rate for smooth, crisp images at high detail. Home-grown online appliance retailer Kogan not only sells products from major brands, but also offers its own private label models at often quite competitive prices. Immerse yourself in stunning 4K quality with 3840 x 2160 pixels screen resolution that this Kogan 65-inch Smart TV offers. It’s boasted to offer vivid colour and extreme detail to draw you into your favourite shows and films. It’s compatible with Netflix and most other streaming services, plus many more compatible Google Play store apps. There are four HDMI inputs and one USB 2.0 ports – if you plug in a USB storage device you can record free-to-air TV to watch back later on, thanks to the PVR (Personal Video Recorder) system. That’s right – you can pause, rewind and record live TV. The included smart remote can function as an air mouse, so you can navigate apps and the internet with ease. The main downside of this Kogan Smart TV is that there is no HDR support, which is usually a major feature of 4K TVs. The affordable TV brand proves that low prices don’t necessarily correlate with low quality. 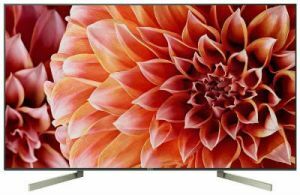 Its Series 9 range has pushed on a step further from previous efforts – the 65 inch model is a few models off from the very top of the Hisense range, but seems to represent good value at $3,999 RRP. The screen on the Hisense 65P9 is arguably not up to the same image quality as LG’s OLED displays, as ULED relies on an LED-backlit LCD panel (i.e. a bright backlight is shone through pixels to create images, and blocks the backlight to create blacks, but light bleed means that these blacks aren’t as dark as in OLED). That being said, this TV uses quantum dot pixels which offer a brighter image with more vivid colours and better contrast, similar to Samsung’s QLED technology. The edge-lit design also allows for a thinner profile. Its Full Array Local Dimming technology, which incorporates individual lighting zones behind the panel, is stated to ensure that light is only produced on the screen where it’s needed for the ultimate viewing experience. The 65N8 has four HDMI inputs, three USB ports, and legacy composite and component video inputs – handy for older peripherals such as gaming consoles. The VIDAA U 2.5 operating system by Hisense is fully customisable and can detect connected external devices. 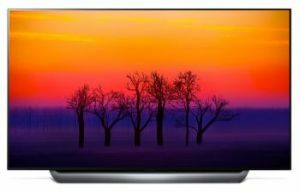 If you’re looking for a TV upgrade without forking out a fortune to get the top-notch OLED, the LG OLED65C8PTA is a solid mid-range buy. While its RRP is $5,299, you can currently pick it up from Appliances Online for under $5,000. 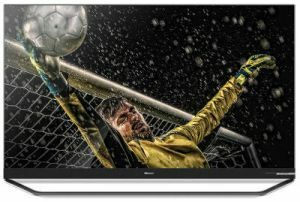 This flatscreen model features a 120Hz field refresh rate for smooth, blur-free video, HLG (Hybrid Log Gamma, a type of HDR format), Dolby Vision, and 10-bit native colour. As an edge-lit screen, it can suffer when it comes to rendering black, but local dimming helps improve contrast. The OLED65C8PTA features wide colour gamut, which is stated to reproduce over 1 billion colours and thus enhance picture quality. There are ten picture modes – Vivid, Standard, Cinema, Cinema Home, Game, Technicolor, APS, Cricket, HDR Effect, ISF Bright Room and ISF Dark Room – with the first five listed also available as HDR and Dolby Vision picture modes. Audio output reaches up to 40W, with six sound modes – Standard, Cinema, Clear Voice III, Cricket, Music and Game. The included LG Magic Remote functions like a cross between a traditional remote and a computer mouse, as you can control your TV by waving the remote across the screen or by scrolling a wheel. You can even use voice commands to change the channel, the volume, or browse content. The TV is equipped with all of the usual ports you’ll find on a modern smart TV plus a USB port. While it’s not at the OLED level of true blacks, the Sony Bravia X9300E produces a bright and immersive picture that stands out amongst LED TVs. Currently retailing for just over $3,000 on Appliances Online, this is a high-end smart TV just short of venturing into the most expensive, highest quality bracket of Sony’s TVs. With HDR10, Dolby Vision and Hybrid Log-Gamma, there’s all the grunt necessary to make the most of the screen. 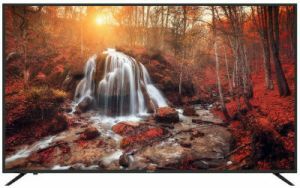 Sony’s unique TRILUMINOS Display has a wider colour spectrum than conventional LED displays, while local dimming control is provided by the backlight drive, which uses X-tended Dynamic Range PRO backlighting to create brightness in the right places. The darks aren’t as truly black as with OLED, but the excellent contrast and light control makes up for this. The ultra-slim design, wall mount bracket, and hidden cable management make the whole TV unit look smooth and modern while remaining practical and accessible. Chromecast is built-in, rather than requiring you to buy a piece separately and use up a port to keep it plugged in. Ports include four HDMI inputs, three USB ports, Ethernet input, and the full set of standard audio and video inputs and outputs. Which 65 inch TV is best? These are just a selection of the wide range of 65 inch TVs available, with all kinds of different features and price points. 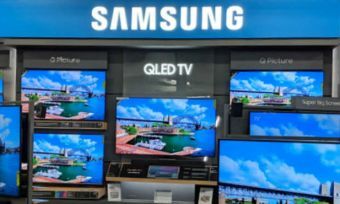 Whether you’re looking for a cheap smart TV or the best smart TV with all of the latest features and newest technology, all of the major brands offer a diverse product range. We suggest reading through the different models available to familiarise yourself with the current TV market, making sure that you understand exactly what each feature is and what it does, before deciding what is most important to you in choosing a TV. Technology shifts rapidly so it’s always worth exploring widely so you can get the best for your budget and your lifestyle and really know what your options are. From there, it’s just a matter of finding the TV that ticks all of your boxes.